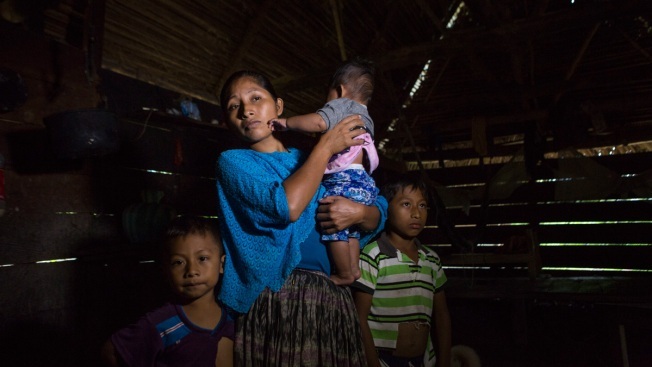 Jakelin's death is a tragic reminder of the plight of Central American migrants as they make the dangerous voyage to seek asylum in the U.S.
Claudia Maquin, 27, answers questions from journalists with her three children, Elvis Radamel Aquiles Caal Maquin, 5, left, Angela Surely Mariela Caal Maquin, 6 months, middle, and Abdel Johnatan Domingo Caal Maquin, 9, right, in Raxruha, Guatemala, on Saturday, Dec. 15, 2018. Claudia Maquin's daughter, 7-year old Jakelin Amei Rosmery Caal, died in a Texas hospital, two days after being taken into custody by border patrol agents in a remote stretch of New Mexico desert. The tiny white coffin carrying the body of the 7-year-old Guatemalan girl who died while in U.S. custody ended its somber journey home in the pre-dawn hours Monday in a dusty hamlet 220 miles north of the capital. Villagers wept and watched curiously as the body arrived at the home of Jakelin Caal's grandparents in San Antonio Secortez, where relatives had set up a modest wooden altar flanked by vases and overflowing with flowers, photographs of the child and the hand-lettered message, "We miss you." The girl's mother, Claudia Maquin, closed her eyes and moaned deeply. Reaching into the coffin, she caressed the child's hair, which was decorated with a white diadem. As the heartbreaking reality appeared to set in, the 27-year-old covered her face and cried. White balloons hung from the wooden rafters, some with handwritten messages such as "We love you Jakelin." In the back, dozens of women prepared tamales and beans to feed the mourners. Jakelin's death earlier this month while in the custody of the U.S. Border Patrol was a tragic reminder of the plight of Central American migrants as they make the dangerous voyage through Mexico to seek asylum in the U.S. It also came as Americans are deeply divided over U.S. President Donald Trump's crackdown on immigration. The child's tragic journey began and ended in the village of about 420 people with no paved streets, running water or electricity. Its residents say declining crop yields and lack of work have pushed many in the community to emigrate in recent years. Underneath a blue tarp stretched over a metal frame, residents displayed a hand-lettered sign addressed to Guatemalan President Jimmy Morales: "We ask you for jobs and electricity, potable water, roads ... so we don't have to emigrate." Another message said the hamlet is home to 83 families "that live in extreme poverty for lack of development and employment." Domingo Caal, the girl's grandfather, told The Associated Press the family couldn't afford to travel to the capital to meet the coffin when it landed in Guatemala's capital the previous day. Nearby communities donated money and grain to the grieving family as the coffin made the 13-hour drive through other villages before reaching its destination. 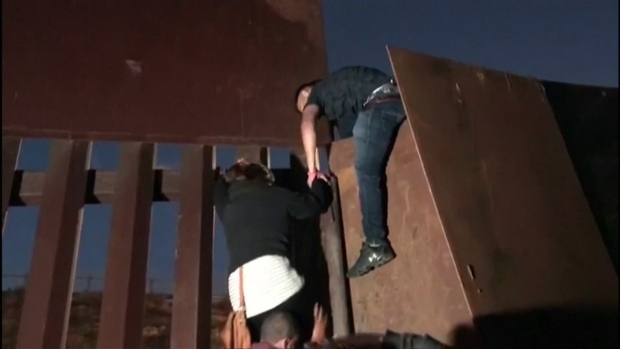 Since a migrant caravan arrived in Tijuana, Mexico, U.S. Customs and Border Protection says the San Diego area has experienced a slight increase in families entering the U.S. illegally and turning themselves in to border agents. The girl and her father, Nery Gilberto Caal Cuz, had been traveling with a group of 163 migrants who were arrested Dec. 6 near a border crossing in New Mexico. The father signed an English-language form stating Jakelin was in good health, but it remains unclear whether he understood what the form said. Hours later, a bus carrying the two left the Antelope Wells port of entry for the Lordsburg station, roughly 90 minutes away. By then, according to a Customs and Border Protection statement, Jakelin's temperature had reached 105.7 degrees Fahrenheit (40.9 degrees Celsius). Emergency medical technicians had to revive her. Guatemalan Foreign Ministry spokeswoman Marta Larra said the ministry had sent a diplomatic note to the U.S. State Department asking for it to monitor the case and determine the cause of death. Relatives plan to bury Jakelin on Christmas Day. Now, the family worries about her father, who went into debt to pay a "coyote," or smuggler, for passage to the U.S. border. They're hoping he will be allowed to stay in the United States and work. Domingo Caal said his son has a Jan. 3 court date to determine his migratory status. Sen. Sheldon Whitehouse, D-R.I., grilled officials working to enforce the Trump administration’s “zero tolerance” immigration policy at the U.S.-Mexico border in a hearing Tuesday.